Please note that this case study was first published on blogs.ucl.ac.uk/eicah in August 2014. The case study was last checked by the project team on 20 August 2014. The jewel in the Daylesford crown, however, was the house, designed by Samuel Pepys Cockerell and constructed at the exorbitant cost of £25,000. [v] Before Sezincote and the Brighton Pavilion, it boasted a ‘Mughal-style’ dome whose interior Hastings had painted to evoke the skies over Bengal. Among the first collectors of Mughal drawings and art objects, he and his wife filled Daylesford with Indian treasures – ivories, silks, silver filigree ornaments, fly flaps set with rubies and emeralds, an agate jewel casket with single-stone diamond spring to lock, Persian weaponry, and chain mail. These ‘Oriental’ antiques vied with Indian-inspired, Western art, such as the fireplace frescos by Thomas Banks, the scenes of William Hodges and the portraits of Johan Zoffany which, along with Hastings’ extensive library on Indian subjects (the former Governor-General had commissioned the first translations of the Bhagavad-Gita and The Hedaya), intimated that Daylesford was the home of a true connoisseur, who knew and loved India better his detractors, Edmund Burke and Philip Francis. Figure 1. 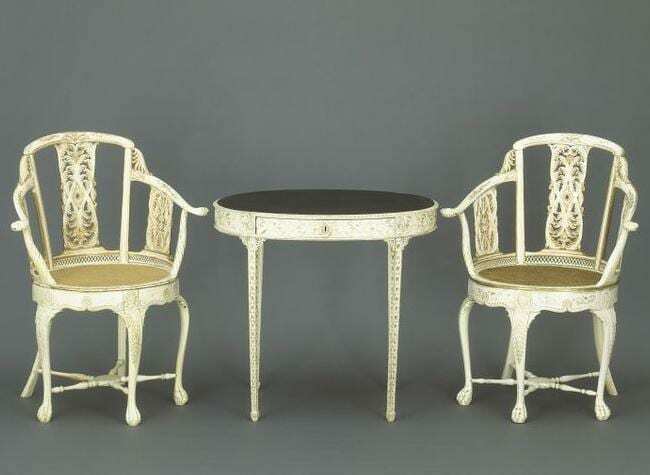 Armchairs and table, Murshidabad, India, c.1785. Ivory, carved, pierced and partly gilded. 1075-1882. © Victoria & Albert Museum, London. Mani Begum of Murshidabad gave these pieces to Warren Hastings as a special gift. At least three inventories of Daylesford are in existence. The first dates from 1799 and was probably made out by Marian Hastings; the second hails from 1837, the year of Marian’s death and was authored by her son Sir Charles Imhoff and his fellow executors; the last was compiled in 1853, when the contents of the house were sold. [vi] Allowing for change and loss, they all depict the rooms, furniture, and ornament fairly consistently. However, the final document is the most interesting to study, since The Catalogue of the Valuable Contents of Daylesford House, Worcestershire, The Seat of the Right Honorable Warren Hastings, 22nd August 1853 singles out wares as specifically ‘Indian’, and takes pains to describe Daylesford’s famous ivory furniture as, for example, ‘solid ivory superbly carved and richly gilt, the elbows finished off with tiger heads’, ‘six chairs of elbow chairs of equal magnificence’, and ‘a solid ivory table, silver laced’ (see figure 1). (With the QUEEN’s leave) your WARREN’s ivory bed! Although Marian Hastings returned from India as a woman of means – her fortune amounted to over £100,000 – the couple’s expenditures and propensity to speculate on the financial market took their toll, and they were forced to live modestly among the splendiferous scene they had created for themselves at Daylesford. [xii] Warren Hastings died in 1818, but his wife survived him by almost twenty years, long enough to campaign for a bust of her husband to be placed in the west aisle of the north transept at Westminster Abbey. On occasion, Marian Hastings would take guests to her ‘Picture Room’ and point out a particularly dramatic painting by William Hodges, which depicted her on her boat in 1782, close to capsizing near the rocks of Colgong, when she intended to join her husband, who had fallen dangerously ill at Calcutta. [xiii] Interestingly, her husband had commissioned this work as a private exhibition piece,[xiv] and its existence speaks eloquently of the lasting devotion the couple felt for each other. [xv] Safely ensconced at Daylesford, Warren and Marian sought to weather the storm of societal disapproval by transforming their home, with the aid of an assortment of iconic tokens –among them, the ivories and Hodges’ paintings– into a veritable Western ‘Taj Mahal’, a monument both to their extraordinary marriage and Warren’s achievements as the creator of ‘British India’. The research and text for this case study were primarily authored by Dr Elisabeth Lenckos. [i] G.R. Gleig, Memoirs of the Life of Warren Hastings, (London: Richard Bentley, 1841) III, 251. On Hastings’ financial status, see P.J. Marshall, ‘The Personal Fortune of Warren Hastings in Retirement’, The Economic History Review, 17 (1964), p. 299. [ii] British Library MS Add. 39879-39889. [iii] Plan of the Parish of Daylesford… (London, 1873). [iv] Gleig, Memoirs of the Life of Warren Hastings, III, p. 243. [v] Lindsay Boynton, ‘The Furniture of Warren Hastings’, The Burlington Magazine: British Art in the Eighteenth Century 112:809 (August 1970), pp. 508-20. [vi] British Library MS Add. 41609-10. [vii] Gleig, Memoirs of the Life of Warren Hastings, III, p. 212. [viii] Cited after: K.L. Murray, Beloved Marian: The Social History of Mr. and Mrs. Warren Hastings (London: Jarrolds, 1938), 160. [ix]Joseph Richardson, et al., Criticism on the Rolliad: A Poem. 2 vols. 8th edition (London: J. Ridgway, 1788), pp. 87-89. [x]Hester Davenport, Faithful Handmaid: Fanny Burney at the Court of George III (London: Sutton Books, 2003), p. 68 and p. 166. [xi] Warren Hastings kept detailed journals while he lived at Daylesford. They record the visits he received and paid. See British Library, MS Add. 39879-39889. [xii] P.J. Marshall, ‘The Private Fortune of Marian Hastings’, Bulletin of the Institute of Historical Research, 37 (1964), pp. 245-53. [xiii] Sophie von La Roche, Tagebuch einer Reise durch Holland und England (Offenbach am Main, 1788), pp. 536-45. [xiv] On the painting see Boynton, ‘The Furniture of Warren Hastings’, p. 520.Also Hermione de Almeida, Indian Renaissance: British Romantic Art and the Prospect of India (Aldershot: Ashgate, 2005), p. 267. De Almeida dates the commissioning of the painting to 1790, but La Roche records seeing it as early as 1786, although not at Daylesford, but at Beaumont Lodge, where the couple resided beforehand. [xv] On the subject of the couple’s devotion, see: The Letters of Warren Hastings to his Wife, ed. Sydney C. Grier [H.C. Gregg] (London and Edinburgh: Blackwood, 1905).